The vestry minute book was presented by the Revd Edward Mahon (1776/7–1847) on his appointment as vicar in 1811. The Mahon family, as the principal landowners in the area, had dominated Strokestown since the late 17th century, and laid out the town as a planned settlement, enhancing the setting of their mansion – the big house at Strokestown. The family produced several Church of Ireland clergy, including the previous incumbent of Strokestown, who was the Revd Maurice Mahon of Clonfree (father of Bartholomew Mahon who endowed the parish charity, and a first cousin of Maurice Mahon MP, the first Lord Hartland of Strokestown House), who served as vicar of Bumlin from 1790 until 1811. It is not known whether his successor, the Revd Edward Mahon, had any family connection with them. The Elphin clergy list identifies him as the son of a farmer from County Clare (he always signed as the vicar; there was a rector also for tithe purposes). 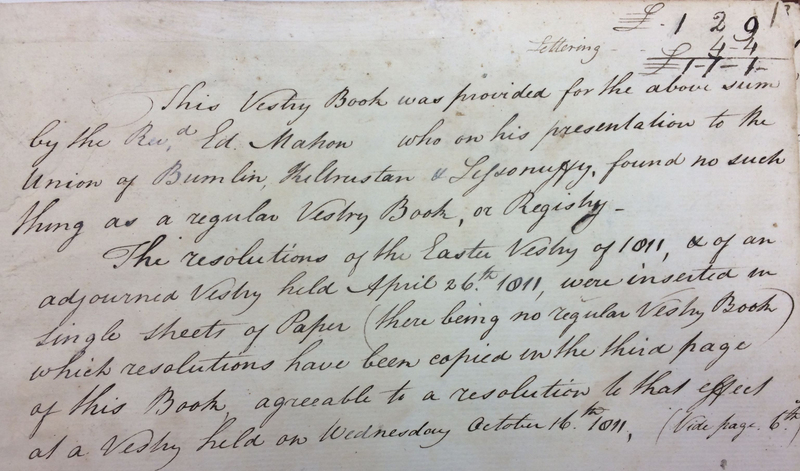 The first page of the Bumlin vestry minute book (a leather-bound volume with lettering on the front) records that there had been no regular vestry book prior to the Revd Edward Mahon’s presentation of it, in 1811. © RCB Library P.737/5/1. Nineteenth-century vestry books have received relatively little systematic attention from scholars, though they are often mined for local and parish histories. Mr Moran’s in-depth analysis, which precedes the online transcription, enables the legal framework of the vestries at this time to be reconstructed as well as the churchwardens’ accounts, the applotments of the parishes of the Union of Bumlin, and the donations from the Mahon Charity fund in the 1830s, to be fully understood. Such data should be of particular value to historians wishing to unpick the complexities of the parish as a unit of local administration, demonstrating how, alongside the parish registers of baptisms, marriages and burials, the vestry minute books form an important and significant component of the records of the Church of Ireland. The operation and functions of the vestry are succinctly outlined, and annual income and expenditure is scrutinised, while in-depth analysis of how the applotment of the parish was carried out, and how all cess-payers (irrespective of their religious denomination) were levied for a variety of civic purposes, is gathered, with Mr Moran noting how “the churchwardens acted as custodians of the cess money collected. No bank was involved”. The rich detail in this particular minute book further allows him to analyse payments from Bartholomew Mahon’s charitable bequest. Following his death in 1815, £800 was left in trust to the minister and churchwardens ‘for the relief of the poor of said parishes, without any distinction as to religion’. The vestry book contains a list of the donations made from the fund in the years 1833 to 1837 even including giving the names and circumstances of the persons assisted – widows, sick, lame, blind, orphans, foundlings – and thus providing a particularly poignant glimpse of the rural poor and indeed hidden Ireland a decade before the Famine.